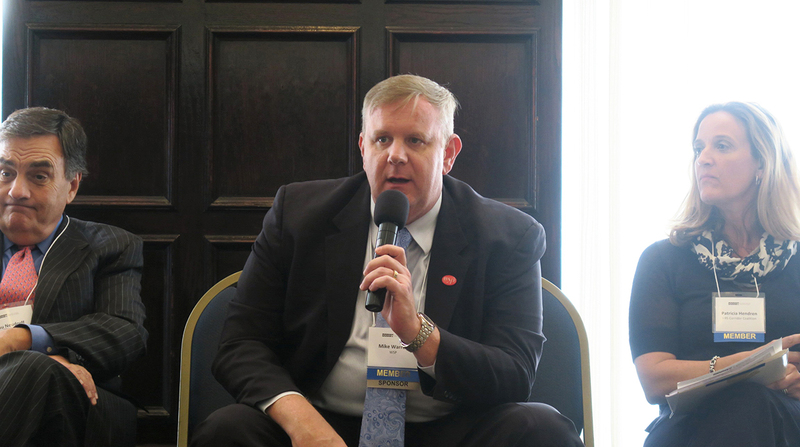 WASHINGTON — Public outreach efforts can dispel misconceptions about miles-based user fee (MBUF) programs, according to Mike Warren, principal consultant at WSP USA. Warren helps lead RUC West, an initiative to develop road usage charge programs involving 11 western states. He represents one of several groups that are leading pilot programs to examine the feasibility of MBUF systems, which tabulate how far a vehicle has traveled and charge the vehicle based on that distance. Representatives of those pilots shared experiences and lessons at the Mileage-Based User Fee Alliance’s annual national conference June 20. The alliance is a nonprofit organization made up of government, business, academic and transportation policy leaders to conduct outreach on the potential for MBUF as an alternative for future funding. Warren said “RUC” is becoming a more commonplace term as people become more comfortable with the idea of this kind of fee. Several panelists throughout the conference said that educating members of the public and government leaders is an effective and necessary practice. Ben Husch, director of the Natural Resources and Infrastructure Committee at the National Conference of State Legislatures, pointed out that frequent turnover within state legislatures begs frequent refresher courses on MBUF. Garrett Eucalitto, program director of the National Governors Association’s environment, energy and transportation division, said one common misconception is that people do not realize that MBUF would be a replacement, not an addendum, to the fuel tax. “There’s a lot of things that come into your transportation system that I think more people need to be aware of,” Eucalitto said. Speakers included representatives of the I-95 Corridor Coalition, Washington, Hawaii, Minnesota, Colorado and California. The California Department of Transportation, known as Caltrans, ran a nine-month MBUF pilot that included both passenger vehicles and heavy trucks. Tacdol by Eleanor Lamb for Transport Topics. Caltrans’ pilot ran from July 2016-March 2017 and included 55 heavy trucks, some of which engaged in interstate travel. Caltrans Road Charge Project Manager Brady Tacdol said the tracking units, produced by fleet management services company ERoad, were similar to electronic logging devices. Tacdol said that customer surveys revealed that most of the fleets were highly satisfied with the pilot, and a couple of companies ended up keeping the service after the pilot. “My commercial heavy trucks were the easiest participants in the entire pilot,” Tacdol said. Daniel Murray, vice president of the American Transportation Research Institute, has said the MBUF method is not ideal because it entails a high administrative cost. ATRI’s purview includes funding analyses. The organization released a “Framework for Infrastructure Funding” report Nov. 8, which determined that a federal fuel tax increase is the best option for achieving a large-scale infrastructure program. The research found that other methods of generating revenue, such as MBUF and increased tolling systems, will fall short of the funds needed to invest in transportation. Maureen Bock, manager of Oregon DOT’s road usage charge program, OReGO, acknowledged that there are a lot of moving parts associated with MBUF programs. She said engaging with both the private and the public sectors can remedy confusion. Hendren by Eleanor Lamb for Transport Topics. Trish Hendren, executive director of the I-95 Corridor Coalition, said the coalition had 150 people in the first pilot and is still looking for additional registrants. Her team conducted a survey to find out why people wanted to participate in the pilot. The survey found that the top three reasons were to play a role in exploration, to see if their data really could be protected and to see how much they paid in gas tax money. A couple other pilot program leaders said that volunteers usually consist of people who are curious about technology and people who want to show that the pilot does not work. Hendren said pilot programs are key to “pushing the needle” on the East Coast. She herself has a device in her car that tracks the distance she logs.